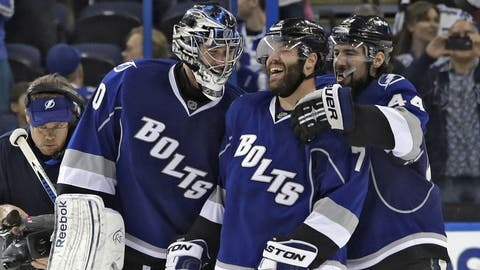 Tampa Bay Lightning defenseman Radko Gudas (7), of the Czech Republic, celebrates with teammates goalie Ben Bishop (30) and center Nate Thompson (44) after Gudas scored an overtime goal against the Carolina Hurricanes. TAMPA, Fla. (AP) — Justin Peters deserved a much better outcome after a stellar 47-save performance. Radko Gudas scored 2:16 into overtime and the Tampa Bay Lightning beat Peters and the Carolina Hurricanes 3-2 on Saturday night. "Sometimes the goaltender is the best player on the ice, and he was tonight," Lightning coach Jon Copper said about Peters. "Fortunately for us, we got that extra one by him." Gudas beat Peters, who kept the Hurricanes in the game with a number of great saves, from the right circle during a 3-on-1. "I wasn’t 100 percent sure if I could make a pass," Gudas said. Gudas helped setup the odd-man rush with a check on Jeff Skinner, who lost his stick on the play, in the Tampa Bay defensive zone. Victor Hedman and Martin St. Louis also scored for the Lightning. Valtteri Filppula had two assists. "It was real hot in there," Peters said. "They were throwing a lot of rubber at the net. We battled. We battled hard, and unfortunately, we weren’t able to get the two points." Carolina’s Jiri Tlusty had a pair of goals. "Our goalie stole a point for us tonight," Carolina coach Kirk Muller said. "Obviously, he was the difference for us." St. Louis re-directed Hedman’s shot during a power play 7:56 into the third that pulled the Lightning even at 2-2. The Hurricanes went up 2-1 on Tlusty’s short-handed breakaway goal at 10:11 of the second. Carolina has seven short-handed goals this season, all coming on the road. However, the Hurricanes are 1-2-3 when scoring short-handed. Tlusty put Carolina up 1-0 when he beat Ben Bishop with a wrist shot on the Hurricanes’ first shot at 4:35 of the first. Bishop had shutout Carolina in both of his previous games against the Hurricanes, making 76 saves over the stretch. Bishop finished with 25 saves. Peters, who entered winless in three games with a 4.00 goals-against-average against Tampa Bay, made 15 saves before allowing Hedman’s goal that tied it at 1 with 3:48 left in the first. The Lightning outshot Carolina 19-8 during the first. Peters stopped all 13 shots he faced in the second, including a post-to-post glove save on Filppula’s shot during a power play late in the period. He turned aside 16 of 17 shots during the third. Tampa Bay defenseman Eric Brewer left in the second with an upper-body injury. Hurricanes defenseman Jay Harrison played seven shfts during the first before leaving the game. NOTES: Injured Lightning star Steven Stamkos briefly skated Saturday. Stamkos, who broke his right leg Nov. 11, resumed limited on-ice workouts about 10 days ago and skated for over 30 minutes Thursday. Stamkos has said he hopes to return in February. … Hurricanes RW Radek Dvorak played in his 1,230th NHL game, which is two away from tying Dino Ciccarelli for 84th on the career list. … Tampa Bay LW Ryan Malone (broken ankle) had an extensive on-ice conditioning session and could return by early next month. … Lightning C Tom Pyatt played after missing 32 games due to a broken collarbone. … Carolina D Mike Komisarek was scratched for the second straight game after being activated from injured reserve.